LG is hopping on the home-brewing bandwagon. LG also kicked off its CES presence by revealing its 2019 TVs, including a jaw-dropping new 8K model and its highly-anticipated rollable OLED TV. And, the firm teased its ambitious plans to launch 5G connectivity in its devices before 2020, with its first 5G phone set to be unveiled at LG’s Las Vegas keynote Monday night. The two companies will reveal further details on the plan during LG’s first-ever CES keynote this evening. LG started off its press conference by discussing the latest improvements in its ThinQ AI and associated devices. ‘We believe the ultimate goal of AI isn’t just to create a smart device that responds to users’ requests but to go a step further,’ Senior VP David Vanderwaal said on stage in Las Vegas. ‘LG ThinQ products will be able to proactively make suggestions. According to the LG exec, ThinQ devices ‘can develop a deeper understanding of user preferences and the overall environment’ to optimize your smart home experience. This includes learning how much electricity you use per day, or the types of TV shows you prefer, Vanderwaal said. It can automatically re-order household products, such as dishwasher fluid, when you’re running out, and set maintenance reminders. LG showed off a slew of impressive new devices on stage at CES 2019, including its new homebrew machine. The system isn’t all that unlike a Keurig; to brew beer, you simply insert a capsule that contains malt, years, hops oil, and flavoring. With that, you can ‘make your own beer in the comfort of your own home with little more than a simple touch of the button,’ Vanderwaal said. 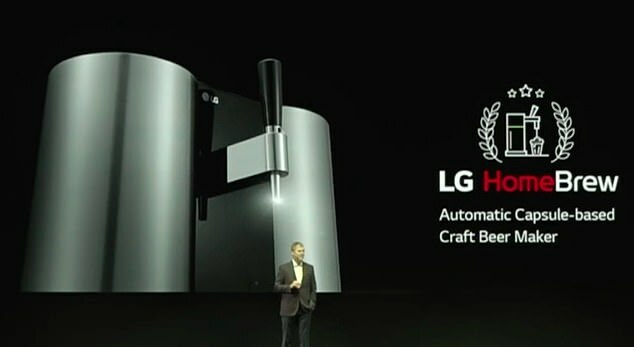 LG HomeBrew can produce up to 1.3 gallons of beer, and can be controlled though an associated smartphone app. Tim Alessi, Senior Director of Home Entertainment Product Marketing then took to the stage to introduce LG’s 2019 TV lineup. 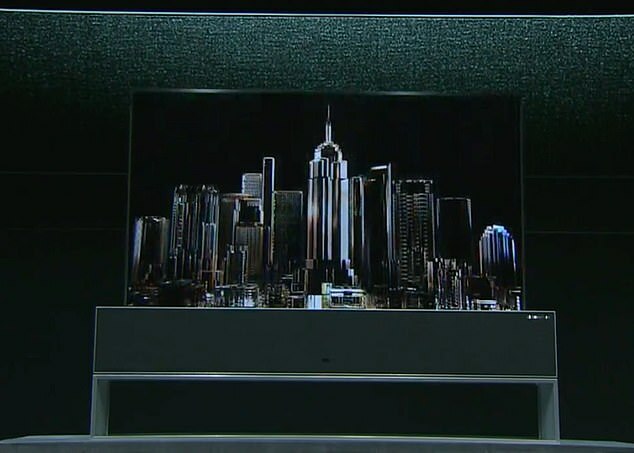 This includes the firm’s ‘largest OLED TV yet,’ at 88 inches. Alessi showed off LG’s first 8K OLED TV, which boasts pixel dimming control technology to optimize the display – which features more than 33 million ‘self-emittting’ pixels. 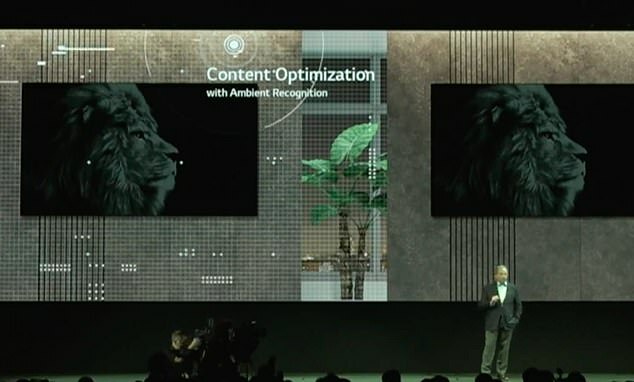 It also contains Alpha 9 processor for AI picture and sound, with two main AI capabilities: content enhancement using deep learning and content optimization using image recognition. The TV improves upon noise reduction and blur, making for sharper details in the picture, while its AI sound allows for deeper bass and clearer voices. And, the TV even knows where it sits in the room, an adjusts itself accordingly. ‘The TV automatically reacts to the environment by adjusting to light levels,’ Alessi said. This lets ‘ LG intelligently adjust sound levels based on position,’ according to Alessi. 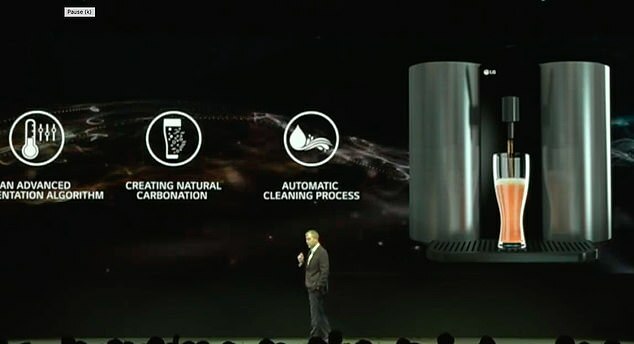 LG also revealed it’s adding support for both Amazon and Apply services, with newly-added Alexa integration in its 2019. ‘Users can set up their ideal Alexa routine, enjoy Alexa experience, control the weather and have a much easier shopping experience,’ Alessi said. The firm also says it is adding Apple AirPlay to its 2019 lineup. ‘We’re really excited to be one of Apple’s first TV partners for AirPlay video,’ Alessi said. LG is also adopting AirPlay Audio and HomeKit.